Do you ever crave a piece of homemade chocolate cake but think it’s too complicated, time-consuming or messy to do one yourself? If your answer is yes then I probably just became your new best friend. This recipe is the easiest, mess-free, healthiest quick cake recipe that I’ve come across the web. The outcome is a delicious chocolate cake, ready in 3 minutes, perfect to curb any chocolate craving but at the same time good for your healthy omens. It’s perfect with a cup of tea, and it makes you feel good knowing that it only contains real, healthy and clean ingredients. You come across similar microwave mug cakes across Pinterest. However, this one is special since it is paleo and perfect for a clean eating diet without using any flour, sugar or butter. It is also naturally gluten-free. I would like to give merit to everydaymaven.com for sharing this wonderful recipe. I made only some slight modifications to the cake. Instead of using blanched almond flour I used ordinary ground almonds (known as “intrita pura” in Maltese). Instead of almond milk, I used carton coconut milk. You could also replace maple syrup with honey. Try this recipe out next time you crave something sweet. You will realise it will make you feel better knowing that you used only natural ingredients but still created a sinful treat! Combine all the ingredients in a measuring jug or bowl. You can use the mug directly, but this step will prevent from having batter sticking to the side of the mug and allows easier mixing. Use a fork or whisk to beat ingredients together until well mixed and there are no lumps. Think of this as beating eggs - you want to aerate the eggs a bit to add some lightness. 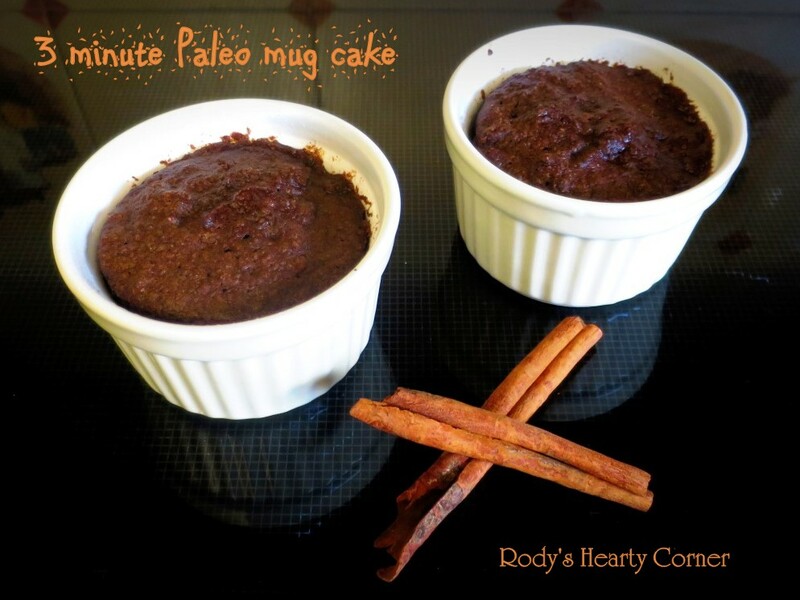 Pour into a mug or ramekin and microwave for 2 ½ minutes on highest setting. The cake will rise. Use a toothpick to check if the batter has cooked. If the toothpick comes out clean the cake will be done, if not give an extra 30 seconds.